Living on the east coast of Canada, you might assume that I grew up on a diet of seafood and maple syrup. But I really didn’t get into the world of seafood, and most specifically shellfish, until I was in university. My family just really didn’t eat shellfish, and probably because of that, it kind of scared me. High on the list of food I was unnecessarily freaked out by were mussels. I had zero interest. None. And then one hot summer day, in glorious Charlottetown PEI, my world changed. Mussels & Fries. Thank you, Lord. So freaking great. Like I was a cast member of ‘Fear Factor’, I took the plunge, dove in, and probably eat a couple pounds, grinning from ear to ear. PS- life is too short to be scared of foods. Try, then decide of you like. Here is a super quick & easy recipe, perfect for a crowd, and deliciousness for days and day. Heat a large dutch oven over medium, and melt your butter. When the butter has melted, add your diced garlic and sauté for 45 seconds. Add your ginger, red onion, & cilantro stalks to the pan, and cook for 5 to 6 minutes, until the onion softens. Add your red pepper, and curry paste, and cook for 1 minute. Pour in your coconut milk, stock, and the juice of 1 lime, and bring to a simmer. Allow the sauce to simmer for 5 minutes. Add your mussels to the pot, and cover. 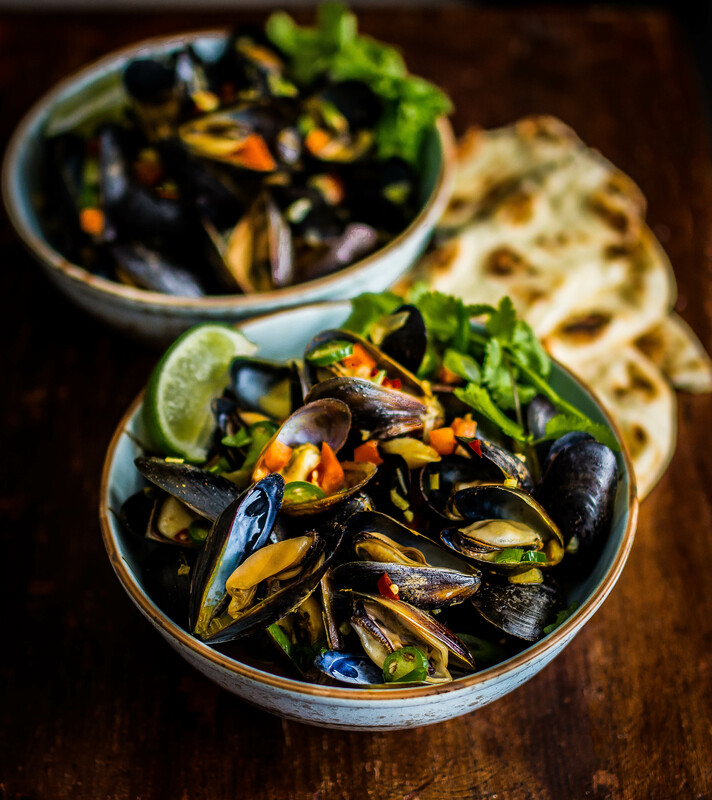 Cook until the mussels have opened (5-6 minutes). If any of the mussels do not open, toss them. 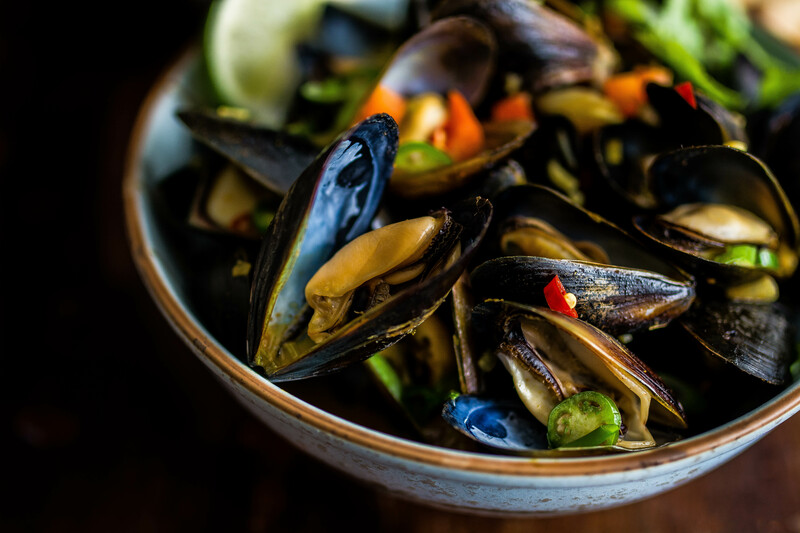 Transfer the cooked mussels to your serving tray, and garnish with fresh chilis, green onions, and cilantro. Pour over any remaining sauce. Serve with naan bread and fresh lime.